Sep 15, 2018; Auburn, AL, USA; LSU Tigers head coach Ed Orgeron celebrates with teammates after defeating the Auburn Tigers 22-21 at Jordan-Hare Stadium. Ah, Week 3. Contenders are emerging (Is that you, LSU? ), pretenders are falling away (what happened, Badgers?) and some positions are crystalizing ('Bama. 'Nuff said.). At least, for the moment. As always, remember we pick the Football Four Playoff bracket as if the season was over. * It could all change next week. Or not. 1. Alabama – Remember all that talk about how Ole Miss might score actual points on Alabama? It happened. On the very first play. Uh oh! … Alabama won 62-7. 2. Ohio State – The Buckeyes got pushed by TCU, but turned it on late to pull away. Dwayne Haskins has transformed the Ohio State offense. The head coach returns to the sideline this week. 3. Oklahoma – Warning sign: For the first time this season the pass defense was, uh, leaky. But Kyler Murray was superb passing and running and the Sooners managed the road win at Iowa State. 4. Georgia – We’re not completely sure about Georgia, because the schedule looks pillowy soft other than LSU and Auburn. Middle Tennessee didn’t show us much. But the ol’ eyeballs say Georgia is really good. 5. Clemson – The Tigers rolled right over Georgia Southern, as expected. Next up, Georgia Tech. Keep watch on Kelly Bryant, who didn’t play in the second half because of a chest bruise. 6. 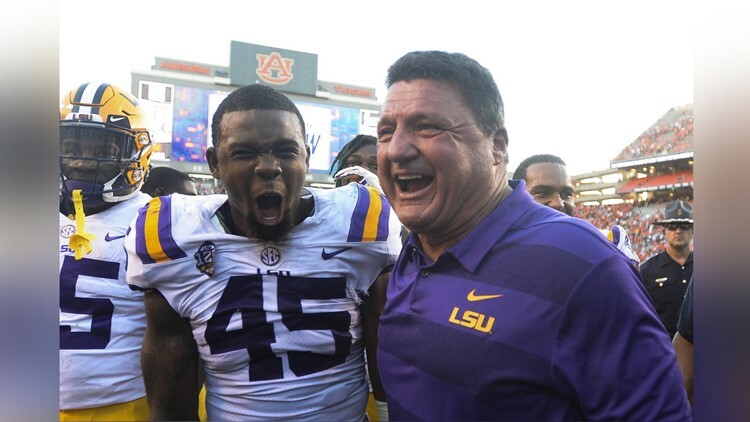 LSU – Coach O and the Tigers nipped Auburn to move to 3-0; their second win against an opponent ranked in the Top 10. LSU has a good defense and a functional quarterback and just maybe, this thing is going to work. 7. Penn State – It was Kent State, so let’s not get too excited. But Penn State is getting untracked. In two weeks, the Nittany Lions host Ohio State. 8. Mississippi State – A fast, physical bunch of Bulldogs blew out Louisiana. Could they make waves in the SEC West? Oklahoma State – Walloping Boise State is a huge statement for Mike Gundy’s bunch – especially defensively. TCU – Mistakes finally felled the Frogs in a loss to Ohio State, but TCU showed off the speed and grit of a Big 12 contender. Stanford – Without Bryce Love, it was a struggle against UC Davis. Auburn – The Tigers’ defense is good. Its offense is surprisingly iffy. No margin for error after the loss to LSU which means they have to beat both Georgia and Alabama away from home. Washington – In a very physical road game, the Huskies were better than Utah. UCLA – It was a terrible, horrible, no good, very bad day. Rutgers – When Kansas roughs you up, you’ve also had a terrible, horrible, no good, very bad day. Southern California – Minus-5 yards rushing. Five fewer than zero. Florida State – Starting Gofundme accounts to buy out Willie Taggart after his third game? Uh oh. Nebraska – Tough start for Scott Frost’s Huskers. Arkansas – Fake fair catch, but no faking the rest of a beatdown by North Texas. * The season is not over. ** Don’t be worried that your team sits just outside the cut. This is a weekly snapshot. And what do we know, anyway? *** See the previous note, but it’s OK to be slightly concerned or very angry. But what do we know, anyway?